Exploring data mining using MATLAB (and sometimes MATLAB Toolboxes). Many data mining and pattern recognition tasks involve calculating abstract "distances" between items or collections of items. Some modeling algorithms, such as k-nearest neighbors or radial basis function neural networks, make direct use of multivariate distances. One very useful distance measure, the Mahalanobis distance, will be explained and implemented here. First, the Euclidean distance is extremely sensitive to the scales of the variables involved. In geometric situations, all variables are measured in the same units of length. With other data, though, this is likely not the case. Modeling problems might deal with variables which have very different scales, such as age, height, weight, etc. The scales of these variables are not comparable. Second, the Euclidean distance is blind to correlated variables. Consider a hypothetical data set containing 5 variables, where one variable is an exact duplicate of one of the others. The copied variable and its twin are thus completely correlated. Yet, Euclidean distance has no means of taking into account that the copy brings no new information, and will essentially weight the copied variable more heavily in its calculations than the other variables. The Mahalanobis distance takes into account the covariance among the variables in calculating distances. With this measure, the problems of scale and correlation inherent in the Euclidean distance are no longer an issue. To understand how this works, consider that, when using Euclidean distance, the set of points equidistant from a given location is a sphere. The Mahalanobis distance stretches this sphere to correct for the respective scales of the different variables, and to account for correlation among variables. Note that it is common to calculate the square of the Mahalanobis distance. Taking the square root is generally a waste of computer time since it will not affect the order of the distances and any critical values or thresholds used to identify outliers can be squared instead, to save time. The point enclosed by the red square clearly does not obey the distribution exhibited by the rest of the data points. Notice, though, that simple univariate tests for outliers would fail to detect this point. 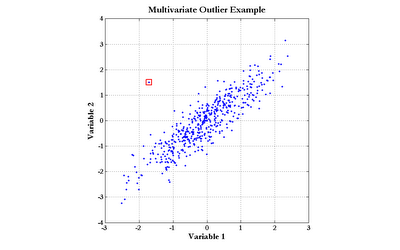 Although the outlier does not sit at the center of either scale, there are quite a few points with more extreme values of both Variable 1 and Variable 2. The Mahalanobis distance, however, would easily find this outlier. I'm glad that you found this of interest. This particular post has consistently been one of the most popular on this log, as measured by the number of visits. I have noticed that this is one of the most popular posts I've ever put on here. I'm curious: What is everyone using the Mahalanobis distance for? I am using this in conjunction with some Taguchi optimization methods, together called Mahalanobis-Taguchi System (MTS), in automotive applications to understand importance of variables on systems with respect to diagnostics and control. I have coded this all in matlab and wish I would have found this sooner! I am using it for a distance metric in Fisher space (for a face detection project in school). currently i doing my final year project for my degree..
and i need to noe how to calculate the distance between two objects by using Matlab. do this Mahalanobis Distance able to help me? do u have more detail information? thank you very much!!! tons of appreciation!!! Thank You! Although not based on the same kind of correlation function, wouldn't you find a N-dimensional distance functon based on Pearson's Correlation (r) to have an approximately equivalent tensor metric without the covariance matrix? Not being familiar with tensors, I could not say. If (and I may very well be misinterpreting your comment) you are saying that the Pearson correlation taken between points would be equivalent (even approximately) to the Mahalanobis distance,then I don't think that's correct. Vectors which are exact multiples of each other, for instance, would all have perfect correlation with each other and zero distance. This is not true for Mahalanobis distance. Yes, the Mahalanobis distance could be used with text documents, assuming that the text documents could be represented by a number of numeric features. I suggest examining the literature for "information (or "text" or "document") retrieval" and "spam detection". Also, specifically look into the "bag of words" representation. I have a simple question (hopefully). I am currently looking at a problem where I am trying to find the best estimate amongst the many that I found. Each estimate has certain variables associated with it for eg, a frequency, a damping and deflection values (lets say at 5 points, this number can vary). Thus each estimate has these seven quantities associated with it. Each of these seven quantities have different units and scales and more importantly the deflection shape variable can vary in itself depending upon the number of points considered. The method I was trying to obtain the best estimate was that I calculated the Euclidean distance of each estimate with every other estimate and then sum it up. Whichever estimate has the least sum is chosen as the best estimate. 1) Since the estimates have variables of different kind and scales, I feel Euclidean Distance might not be the right measure. 2) frequency and damping attribute might always be less heavily weighed in comparison to the deflection shape, as deflection will always have more values associated with it (depending on the number of points chosen). 3) Since these are all estimates of the same quantity, they will all be very similar to each other and thus highly correlated, and going by your definition of Mahalanobis distance, it doesnt seem to be the right measure for this task. Mahalanobis distance, by the great P. C. Mahanalobis is a great measure when we are dealing with the exponential family. Furthur, this distance is prone to outliers, it can be robustified using Robust location and scatter estimators. 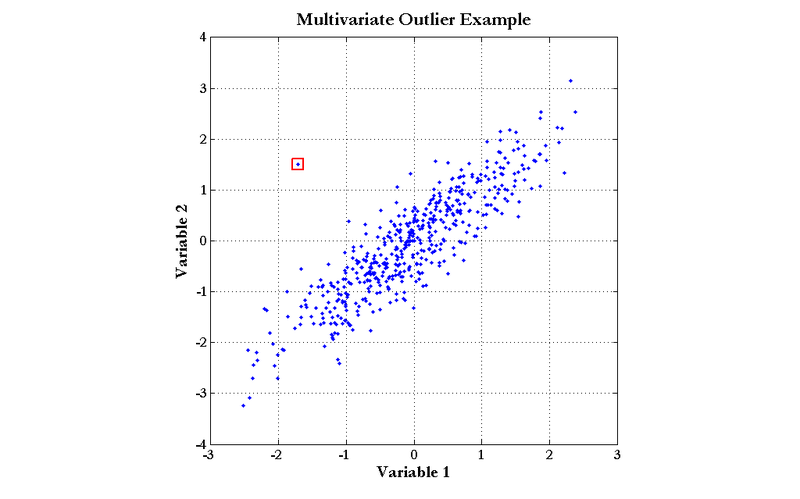 One such estimator is the Minimum covariance determinant.Sadly, oftentimes, the outliers are all pervasive in real data and one has to use robustified estimates in the Mahalanobis. I am using mahalanobis distance. I found that the covariance matrix is singular and has no singular matrix. Does anyone have some idea? Hi Richard, to avoid a singular matrix you can use the pseudo-inverse of the covariance matrix (pinv(cov(data)) instead of the inverse (inv(cov(data)). Am using this one for fraud analysis reporting on a web-based fleet management system. Refueling transactions for vehicles occur over time in a 2-dimensional space (latitude/longitude). Each month the new transactions are compared to the last 12 months worth .. and any new transactions with a mahal distance outside of the norm are flagged for investigation. Will see if its fast enough to calculate on demand written in PHP. Hope so. Hi, I am finishing a project. It is exactly as you say on pattern recognition. Given 100 images belonging to 10 classes, and so on. Now I have to calc Mahalanobi's distance and find the smallest. Thanks for your post. thanks! We use it to measure the distances between propensity score distributions in 2 different groups. Hello, really thanks for your post it is interesting. I am working in images macthing in distance and I was thinking to use euclidean distance but I read your post and now I feel lost. Could you tell me what advantages can take mahalanobis in my case??? Hello, wow your post have done that i change my way to proceed. I am working in matching image in distance, so i was thinking in euclidean distance as a method. then i need to discriminate and say if each point has lees than 3mm take this image as a reference. Coud you tell me what advantages could have mahalanobis in this case? I like the plain english style, much easier to understand then the wiki-pages. Thank's! This is great blog. I also developed my own matlab code for mahalanobis distance (with online calculator of mahalanobis distance) in http://people.revoledu.com/kardi/tutorial/Similarity/MahalanobisDistance.html. Hoping you can help to share this. Search "Data Mining in MATLAB"
Why MATLAB for Data Mining? (C)2012 William Dwinnell. Awesome Inc. theme. Powered by Blogger.